Bombus hypnorum (The Tree Bee) was recorded as new to Britain in 2001 in Landford, Wilts. Since then, the bee has spread rapidly, and is now plentiful in many parts of England, Wales and southern and central Scotland. The aim of this project is to monitor the spread and status of this new arrival on a yearly basis. Late May and early June is peak activity season for this distinctive bumblebee, and BWARS has been mapping the spread since its discovery 16 years ago. After a very successful call for records last year, we have decided to run our campaign again. Any new records for 2017 should be submitted to Stuart Roberts (spmr[at]msn.com) with the word "hypnorum" in the message line, or online through the BWARS website here so that new maps can be drawn. Records should include full details of locality (grid reference or a postcode), date, recorder and identifier and, wherever possible, a photograph for verification purposes. Updated maps will appear here as and when new records appear. The 2017 records will appear in red. For more information about finding this bee see the Open Air Laboratory Bee Research web pages. 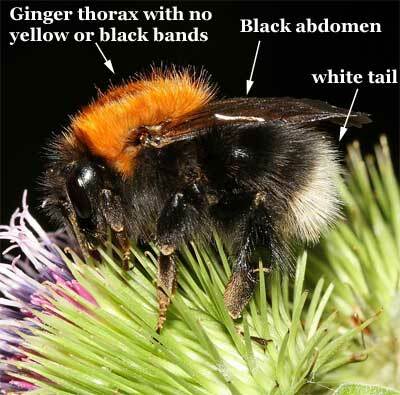 It's fairly simple to determine Bombus hypnorum. hairs are replaced with dark ones.